Spring in New York is marked by an abundance of dark leafy greens at farmers’ markets here in the City. Vegetables such as spinach, tatsoi, kale, chickweed, dandelion greens and broccoli rabe gradually make their appearance at our Greenmarkets, timidly at first, then in a dizzying succession until a profusion of GREEN becomes a regular visual occurrence. Kale seems to be one of those greens that has a bad rap, mostly because people don’t know what to do with it — other than boil it to death or transform it into kale chips. I love kale for its appearance — the leaves have a gorgeous, edgy beauty matched by almost no other vegetable. Cooked with olive oil, garlic and lemon, its texture becomes silken, which makes it a perfect match for pasta … or as a side dish in its own right. Note: The dish pictured above is NOT gluten-free nor is it vegan (because the pasta is egg-based and I used Parmigiano-Reggiano cheese as a garnish); that being said, you can probably make the appropriate substitutions, such as using gluten-free egg-less pasta or by eliminating the cheese, if you were so inclined. Bring a pot of water to a roiling boil. Add a generous pinch of salt. Add pasta and cook until al dente. Reserve 1/4 cup pasta cooking water, then drain and set aside. Bring a pot of lightly salted water to a boil. Add kale and cook, partially covered until kale becomes crisp-tender (the leaves should still be a bright emerald green), about 2 to 3 minutes. Drain, then immediately plunge the kale into the bowl of ice water. This is a step known as blanching; it will help stop the cooking and preserve the green color. Drain the bowl and squeeze out as much water as you can from the kale. Chop the kale coarsely. You may, if you wish, finely chop the stems. Add garlic to a cold sauté pan. Add about 3 to 4 tablespoons olive oil to the pan; gently warm oil over medium heat. When the garlic begins to turn a pale gold after about a couple of minutes, add the greens to the pan along with a pinch of sea salt, the dried red pepper flakes, the lemon juice, and the lemon zest. Stir a few times; cook over medium heat or until the greens become tender, about 6 to 8 minutes. Add the cooked pasta directly to the pan. Fold pasta into the kale mixture. Stir in the diced tomatoes. If the pan seems too dry, add the reserved pasta cooking water to the pan, tablespoon by tablespoon until a light sauce is formed. 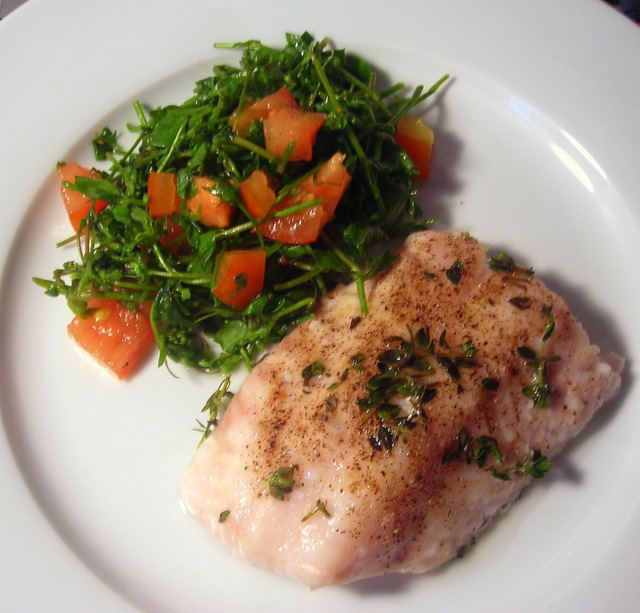 Cook until pasta and greens are warmed through, an additional 2 to 3 minutes. Taste once more for salt and pepper, then spoon pasta into serving bowls. Drizzle with a little extra-virgin olive oil, garnish with freshly grated Parmigiano-Reggiano cheese (if using), then serve at once. 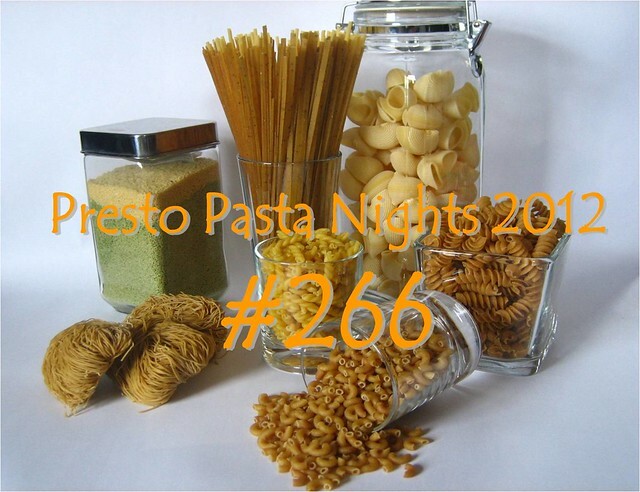 This is my contribution to Presto Pasta Nights #266, a weekly foodblog event that I’m currently hosting (for the very first time I might add, ever since I began participating over a year ago! ), and organized by Ruth of Once Upon A Feast. Even if you’ve never participated before, we’d love to have you! Here’s the deets: All you have to do is write about a pasta, share the recipe, mention Presto Pasta Nights and Simple Kitchen Seasons (with links) . Send your entries to SobaAddict70 (at) gmail (dot) com and cc ruth (at) 4everykitchen (dot) com by Thursday to make it into this upcoming Friday’s roundup. 27 May	This entry was published on May 27, 2012 at 11:22 pm. It’s filed under American cuisine, cooking, food, food photography, general, Presto Pasta Nights, recipe, spring, Union Square Greenmarket, vegetarian and tagged dinner, food photography, heirloom tomatoes, kale, pasta, Presto Pasta Nights, spring, vegetarian. Bookmark the permalink. Follow any comments here with the RSS feed for this post. 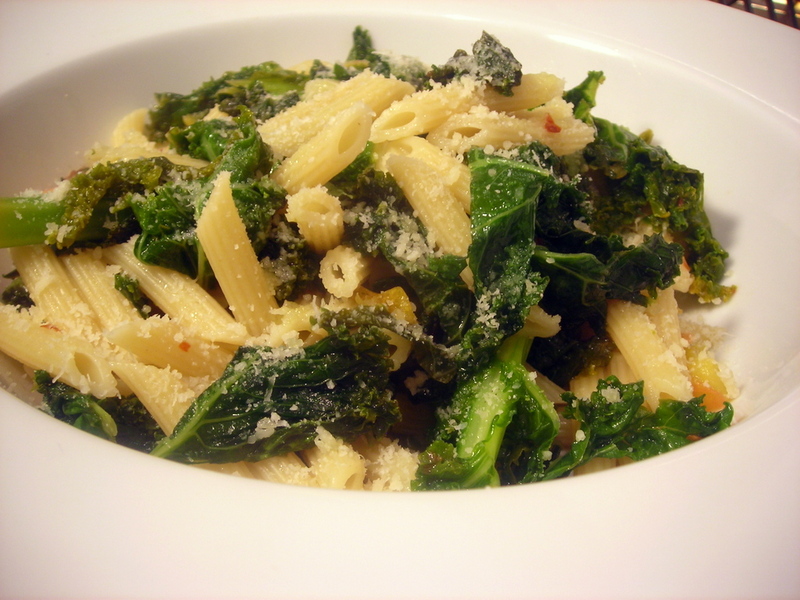 I do love Spring Greens and yours look wonderful… especially starring in that pasta dish. Thanks for hosting this week’s Presto Pasta Night Roundup. Thanks, Ruth. My pleasure … and I suppose it will give me good practice for future hosting. Just cooked up an enormous batch of kale last night. We ususally put it in frittatas, but it looks perfect w/pasta. Yay! It’s great, isn’t it? I have a serious love affair with vegetables of all kinds, especially the ones that don’t get much respect. Thanks for stopping by Jenni. I’ve never seen chickweed before. Is it anything like watercress? Not really. It has a faintly sweet, “grassy”, hay-like flavor and an appealing, crunchy texture. I don’t like to do too much to it … a simple vinaigrette of say, hazelnut or extra-virgin olive oil, lemon juice, chives, sea salt and black pepper is all you really need to elevate it to something special.